Moondog Web Design News: Support for Windows XP is ending soon. Run for your life! Support for Windows XP is ending soon. Run for your life! The world is probably not going to end on April 8, 2014, but support for Microsoft's enduring Windows XP operating system definitely is. 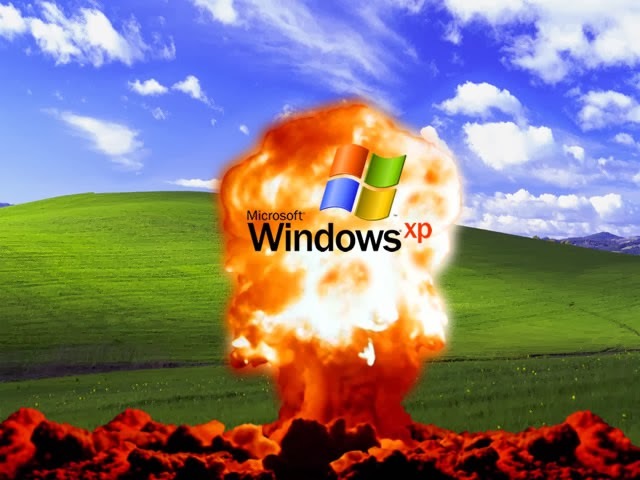 If you continue to use Windows XP after that date your computer is not going to burst into flames or eat your cat, but even with updated antivirus software installed, it will become five times more vulnerable to security risks. In fact, cyber-criminals have probably been holding back certain exploits, just waiting for Microsoft to depart the scene. Given the fact that 25%-30% of the worlds computers are still running Windows XP, that is an enormous base of soon-to-be vulnerable machines for the bad guys to exploit. But I'm happy with my old XP computer, can't I just keep using it? You can, but I wouldn't. Most of my friends who are still running XP tell me the same thing: XP is good enough for what I use my computer for. It may have been good enough in the past, but unless that computer is never connected to the Internet, that is no longer the case. Some computers running XP can be upgraded to Windows 7 or 8, but for most folks it is probably best to just bite the bullet and purchase a new machine with a modern operating system. New PCs running Windows 7 or 8 are 1/3 less expensive than Windows XP computers were in 2002, and if you are tired of Windows, Google has Chromebooks starting at just $249. Right now my alpha geek friends are screaming, "just install Linux!" and the Steve Jobs disciples are screaming, "just get a Mac!" Those are also viable options, but honestly most folks who are still using a 13 year old PC aren't likely to take either of those routes. Like it or not, it is time to take action. One thing is certain. The ostrich method will not work. It is time to let go of Windows XP and move on with your computing life . There won’t be another grace period. April 8 marks the beginning of ever increasing security risks for Windows XP, and it is only going to get worse.